Mercy is not a talking pig. She is a “porcine wonder,” as her owners, Mr. and Mrs. Watson, often say, but she is a pet living in the real world, and as such, she does not have any magical powers that make her talk. We are privy to many of her thoughts - most of which involve her love of buttered toast - but even these are related in the third person and do not resemble sophisticated human thoughts. Most of the human characters in the series are not children. 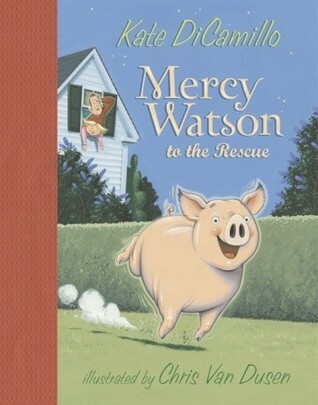 The story is set on Deckawoo Drive where the Watsons live, and the most involved characters are the Watsons, their elderly next door neighbors, Eugenia and Baby (so named because she is the younger sister), and the various emergency personnel involved in rescuing Mercy from her various adventures, including a police officer, two firemen, and an animal control officer. Each of the characters often behaves in a way that is very child-like, but they are all grown-ups, with the exception of two children who appear briefly in a couple of the books. The language in the books is very rich. Kate DiCamillo has such a distinct voice, and I hear it loud and clear in these books, in the same way that I hear it in Bink and Gollie. The sophistication of the vocabulary she uses, and of the way she puts together sentences makes it hard to categorize these books. My previous library had them in easy readers; we treat them as fiction in my current one. But neither category is a perfect fit because the books are just so unique. No one else writes like this, and Cynthia Rylant is the only other author I can think of who writes about adults as her main characters. Mercy Watson is living in the 1950s. The references are very subtle, but they’re there. The convertible which Mercy accidentally drives in Mercy Watson Goes For a Ride is obviously old-fashioned, and the Watsons’ kitchen has a definite 1950s decor. Chris Van Dusen’s illustration style and color palette are even kind of retro, making the series stand out as unusual - and delightfully so - even more. I really loved reading these books. The formula wherein Mercy’s love for toast gets her into trouble, but then ends with the whole neighborhood sitting down to eat toast, never gets old because DiCamillo continually approaches it from different angles. The gentle stories evoke innocence, but also keep the reader entertained, and the quirky small-town characters are the kind of people any reader would want to meet in real life. I very highly recommend these books to first-, second- and third-graders and the adults in their lives.